I've had a rough week or two. We've had to utilize the flexibility available through homeschooling. Everyone (let me repeat: EVERYONE) has been sick with the flu. I have spent all week cleaning up various forms of things that fly out of children when they're ill. So, I'm going to do something I've never done before. I'm going to post a picture of one big massive mess in my home. There's more than one, but I'm taking baby steps. What I'm hoping will happen is that some of you will post your own mess and I can link to you. I want to see the kind of mess that would send you to the ER if someone showed up unannounced. I'm guessing the drawer landed in the bathroom?? LOL I commend you for posting your pic. My digital camera isn't working or I would post one of my dresser...it looks similar! I was going to ask about that drawer. I think I'll ask about the guitar instead. Who plays? Thank you so much for posting this pic. It's such a relief to know I'm not the only pile-builder. Got the guitar for Christmas. 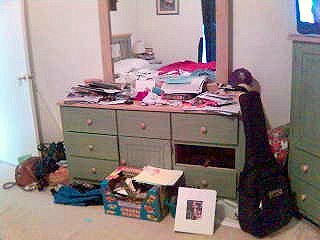 If you look really closely at the white folder on the floor, you can see a pic of my face on Sheryl Crow's body (it's my music folder). Hey, this is kinda' like Where's Waldo! Oh my gosh. You are me! I'm going to go take a photo of our bedroom. Thanks for posting this! Sometimes it feels like everybody else in the world has perfect homes. I guess the drawer landed in the kitchen? ROFLOL!!!!! I can relate very well my dear! I am guessing the drawer is under your master bedroom bed... so when do you tell us where it is??? I'll reveal sometime next week! Wanna' give people a chance to come back from the weekend. Isn't it wonderful to know that behind those pretty front doors is a land different from what everyone sees? I can't wait to get my stuff together so I can actually have people come over! I'll save me some time. My kitchen looks just like Kat's (clutter wise). LOL! Thanks GOD I'm not alone! There ARE others like me! Give me time and I might get up the courage to show you! Oh how I miss the days when I could let my house get that messy! With people comeing to look at it all the time, there's just no way I could do that! I guess the bathroom too for that drawer. I'll have to dig them up sometime and post the archives, I'm too lazy today. I have to tell you, my dresser drawer is missing like that too, my husband said he'd fix it like 3 yrs ago (it feel apart) and it's still under my bed!